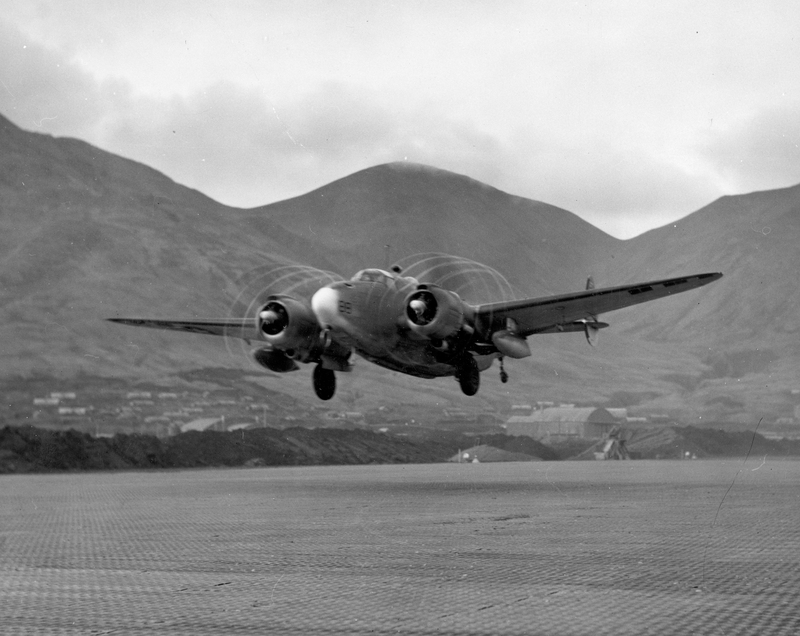 A VB-136 PV-1 Ventura takes off from Casco Field, Attu Island in the fall of 1944. The morning of August 27, 1944 was a cold one (they all were) on Attu Island in the Aleutian chain. 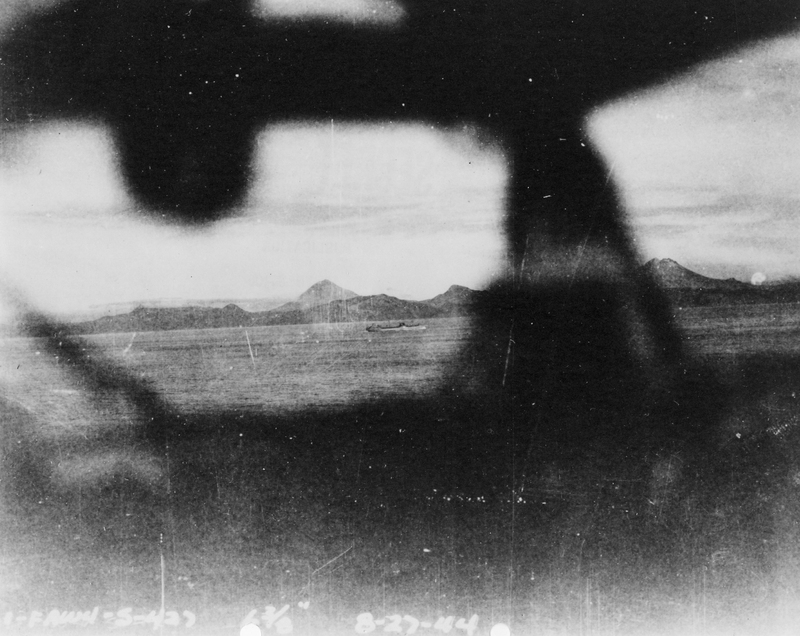 There on the edge of nowhere, Fleet Air Wing Four’s Lockheed PV-1 Ventura bombers carried on a fitful war against Japan’s northernmost bases in the Kurile Island group. 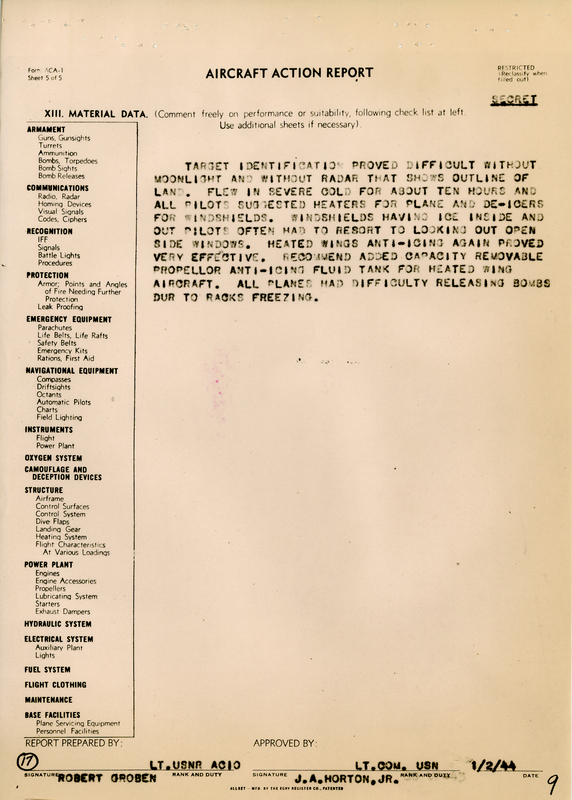 Whenever the weather cooperated, the Ventura crews would sortie forth to hunt for shipping to bomb and land bases to attack. Lt. Everett Price and his crew from VB-136 took off that morning just after 0700, bound for Otomari Zaki, one of the islands in the Kuriles. Price had orders to strike at any Japanese shipping encountered, or supplies discovered on the island there. It would be a long flight, and the Venture carried one thousand four hundred and fifty gallons of fuel to feed its twin Pratt & Whitney R-2800 radial engines. 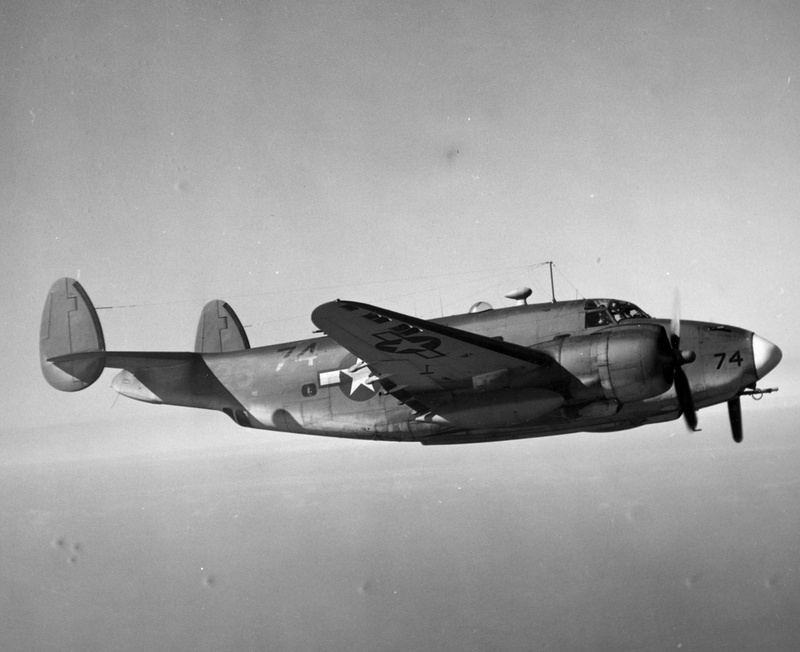 A VB-136 Ventura on mission. At four thousand feet, Price tried to gauge the wind speed that day by looking down at the waves below. After studying the water, he concluded that the breeze was about half as intense as the 30 knots they had been told to expect earlier that morning. He told his navigator, Ensign George Campbell, to factor that change into his calculations. Not long after, Campbell fixed their position with a sunline and LORAN and he concluded they were 450 miles from their target area and about 175 minutes out. They were also off course to the north of their intended flight path. Campbell made some corrections and passed them to Price. Later that morning, they spotted the Kamchatka Peninsula, watching it pass by on their starboard side. Flying in and out of clouds, they finally sighted a tall volcanic mountain that they thought was Araido To. A few minutes later, after four hours in the air, somebody called out two vessels off to starboard. Price made them out, perhaps twenty-five miles away. Towering clouds loomed in the distance to the south, and a fog bank hugged the wave tops near the two ships. They were close to the coastline of one of the Kurile Islands, which the aviators thought was Onekotan. Price and his copilot, Ensign Francis Praete, banked the PV-1 toward the two vessels while the crew studied them with binoculars. One looked like a Japanese picket ship. The other was a tanker–a prime target for the Navy crews. One of Gavin’s photographs that he shot with the K-20 while crouched between Price and Phaete. Here, the PV-1 crew is making their attack on the tanker. Game on. Price pushed the yoke forward and dove to the attack. They dropped down to seventy-five feet and leveled off. The tanker seemed to be making about ten knots on a northeasterly course, and Price positioned the PV-1 for a beam attack. Four thousand feet from the target, Price opened fire with the Ventura’s bow guns. He two second burst fell wide of the ship, chewing up the swells just forward of the tanker’s bow. He corrected, and hammered the vessel with a long, eight to ten second burst. The plane’s five .50 caliber machine guns spewed out about five hundred rounds, tearing through the bridge and superstructure, puncturing the hull and causing extensive damage. Closing at 240 knots, Price kept firing, walking the nose back and forth with rudder inputs to try and suppress the anti-aircraft fire that was now directed against them. 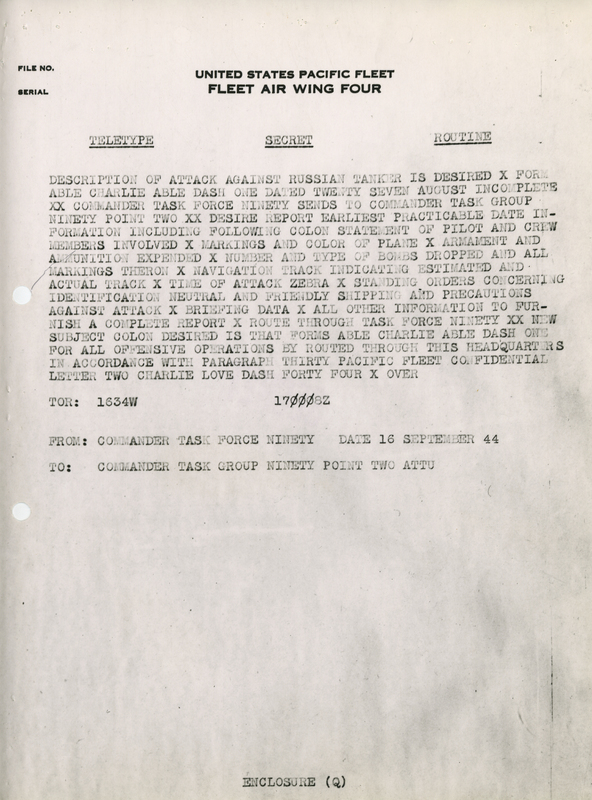 Several guns were located fore and aft on the tanker, and while they were not using tracers, the crew could see their muzzle flashes and feel near-misses buffet their aircraft. This was the critical moment. Price remained laser-focused on executing their bomb run, Praete next to him on the controls as well. Between them crouched Paul Gavin, the radioman. He held a K-20 camera in hand and was shooting photographs of the attack. The final seconds of Price’s bomb run. Photo again taken by Gavin. The intercom suddenly lit up with chatter, but Price was so focused he couldn’t make out what was being said. Then Gavin suddenly pounded on his shoulder. Price ignored him. The tanker swelled before them, its masts well above the PV-1. One mistake now, and they’d careen into the ship and all be killed. Lieutenant Price triggered the bomb release. Three bombs were supposed to fall out of the bay at hundred foot intervals. The first, an incendiary, failed to arm. The second, a 500lb General Purpose bomb, hung on the rack and failed drop. The third, another incendiary, released perfectly. It struck the tanker directly amidships and punctured a meter square hole in the hull about six feet above the waterline. Price pulled up at the last possible moment, narrowly missing the tanker’s mast. 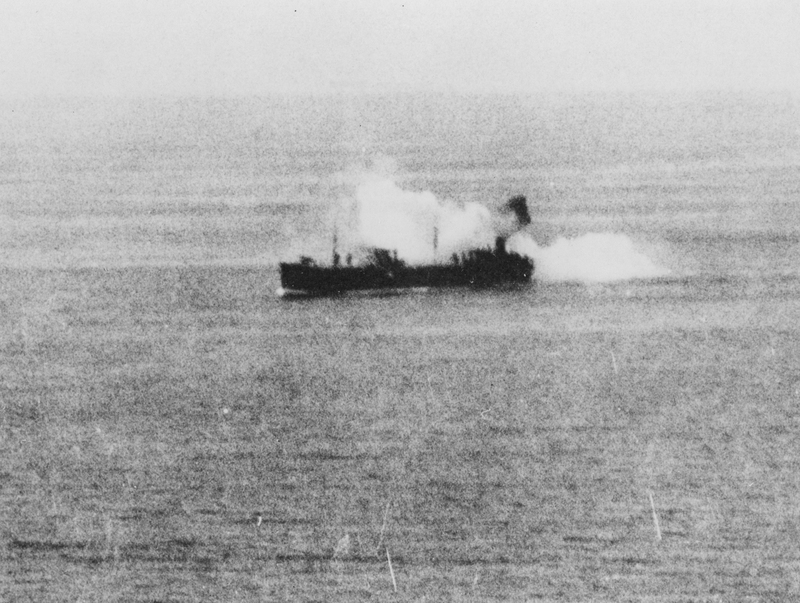 As they cleared the area, Gavin snapped photos of the vessel burning, smoke boiling from the direct hit. It was a masterful masthead level bombing run, the sort perfected by the 5th Air Force, then passed on to the U.S. Navy’s bomber squadrons. Except that the tanker was the Russian USSR Emba, a Suamico class fleet oiler built in Portland, Oregon. Completed in May 1944 she was handed over to the Russians as part of our Lend-Lease program at the end of June. The Russians had crewed it for only two months when Price’s crew put a hole in her hull. Moment of impact. Price’s third bomb strikes Emba amidship. Emba survived the war and the Soviet Union turned her back over the United States in 1948. She was renamed Shawnee Trail, AO-142 and served through the 1960s in both the USN and the merchant fleet. She was sold for scrap in 1973. It turned out that the chatter on the intercom during the bomb run came from the plane captain, Paul Knoop, who had spotted “USSR” written on the Emba’s side. Gavin also spotted Russian markings, which was why he started hitting Price’s shoulder. When the PV-1 returned to Casco Field on Attu, Price found himself in the middle of an international incident. It turned out the crew had erred in their navigation and had wandered over the Russian sealane between the U.S. and Vladivostok. This sealane accounted for 50% of all the material sent by the United States to the Soviet Union during the war. Gasoline, oil, trucks, raw materials, railway cars and locomotives were all delivered via the Pacific Route. 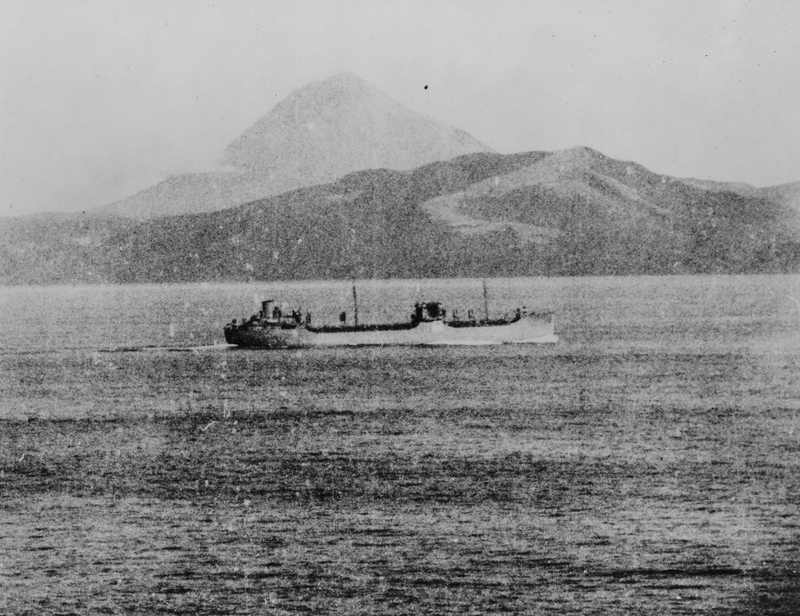 Armaments, aircraft, ammunition were all prohibited due to the touchy neutrality issues between Russia and Japan, so everything carried through Japanese waters had to be non-combat related. An investigation commenced almost at once. A U.S. Navy inspection team examined the Emba on September 2, 1944, counting over a hundred and fifty bullet holes on the bridge alone. Other rounds pierced the hull and narrowly missed the ship’s doctor. Fortunately, the bomb hit did not compromise the Emba’s watertight integrity and caused no casualties. Price and Phaete were disciplined for their mistake, though what that discipline was is lost to history now. Fleet Air Wing Four redoubled its ship identification efforts, and went over the recognition signal procedures with all air crew. The message that no squadron commander wants to receive. Ever. The co-pilot’s name was Frank Praete ( not Phaete ) and he was my step father. I remember him telling this story on numerous occasions. The other crew names sound familiar as well. Preston, that is amazing! Thank you for the comment. Do you have a photo of him? Sure – whats your email address? Please email me and I will send a picture. Thank you for writing this article. Preston, I fixed the misspelling. Thank you for the correction, and my apologies for the mistake. Dear John, thank you very much for he article. I have been trying to solve this incident for almost a year, after reading about it in War Diaries of VB-136. The problem was, that two available to me Russians sources marked a different date for attack on Emba- 14 October 1944, as well as different location (Shimushu Strait as oppose to 40 miles North of Cape Lopatka, based on photo analysis). Very nice pictures of “Venturas”, too! May I ask you about the source?